Photographing the family is the reason many of us bought a Canon DSLR in the first place. But taking portraits of young children can be more trouble than it’s worth – especially when it comes your own kids who refuse to pose or smile as soon as you get your camera out. 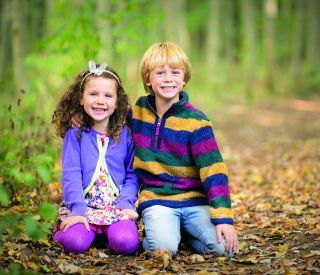 The key is to have fun outdoors – we headed to our local woods in early autumn just as the leaves were starting to fall – and, as children don’t like sitting still, you need to shoot fast before they run off or get bored. We’ll explain more top tips and camera settings to make the photo shoot fun for everyone. Get your telephoto zoom lens out as it enables you to shoot from a distance so you’re not crowding your little subjects, plus, with a wide aperture, it will help capture a shallower depth of field to blur surroundings for a more dreamy portrait style. A 200mm focal length is ideal, and you’ll need to match this figure with a fast shutter speed to overcome camera shake and blurry shots. On the full-frame 5D Mk III we’re using, we used a shutter speed of at least 1/200 sec to combat camera shake – while on crop-factor cameras, like an 80D, use a shutter speed over 1/320 sec. Then use specific AF points to focus on the kids’ faces or eyes for a sharp result. We headed to a pretty woodland setting, and shot in Av mode with an aperture of f/2.8. As it was fairly dark inside the woods, we needed our ISO set to 640 to achieve a shutter speed of 1/200 sec. If it’s darker, up your ISO further to get the right shutter speed. Using a long focal length of 200mm, with a wide aperture, will really reduce depth of field and blur the foreground and background details around your subjects to ensure they stand out. We used Canon’s fast EF 70-200mm f/2.8L IS II USM but any tele-zoom will do. A wide aperture of around f/2.8 or f/4, depending on your lens, will help blur the background behind your little subjects; but make sure they are a good distance (at least 25-30 feet) from the background elements, otherwise they’ll remain too noticeable in the frame. Get down low to the children’s eye level for the best results; this also reduces how much foreground is in the shot too. Getting mum or dad to stand behind you making faces is a good way to get a fun reaction from the kids – as our portrait (left) illustrates. TOP TIPS: Learn to have fun! As kids rarely sit still, make a virtue of it and shoot the action as they run around the fields or woods, or in autumn time, throw piles of dried leaves around. It gives them something fun to do, and also provides great expressions to capture – but you’ll need to be quick! Kids often won’t smile nicely for photos, but will happily pull silly faces. It can be frustrating sometimes, but have fun with them instead, showing them the shots as you go as they’ll enjoy seeing the silly faces – and want to do it again!